Donna Emanuela de Dampierre, the first wife of HRH Don Jaime, Duke of Segovia, second son of King Alfonso XIII, died on May 2 at her home in Rome. She was born in Rome and she died in Rome. Her first marriage took place in Rome. Her civil divorce from her first husband was recognized in Italy. Her second husband was a wealthy Italian stockbroker. He died in Italy. Her long time lover, Federico Astarita, was an Italian lawyer, who died in 1974. Although Emanuela and her second husband, Antonio "Tonini" Sozanni were separated for many years, they never got a divorce. Sozanni, who supported Emanuela and her sons, died in 2007. He was survived by his widow, Emanuela. 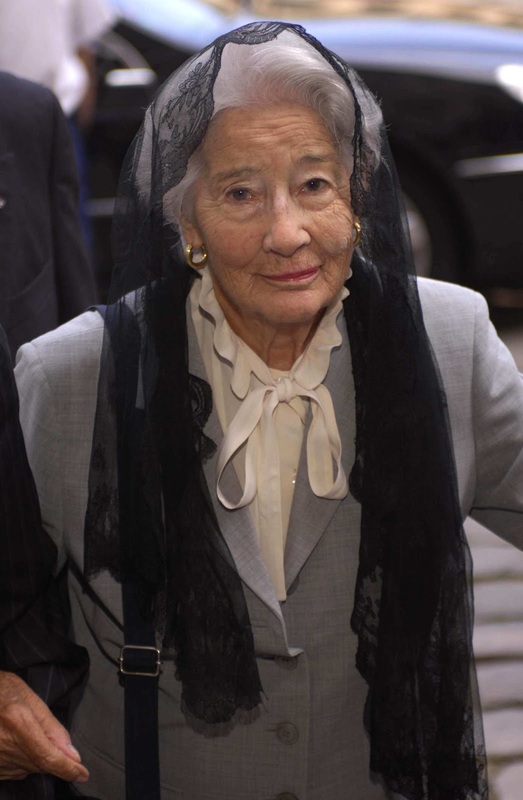 Emanuela, who was 98 when she died, was the daughter of a French viscount, Roger, Viscount de Dampierre, who had inherited a papal title, Duke of San Lorenzo. He was married to Donna Vittoria Ruspoli, whose mother was American. Emanuela's parents were divorced in 1930, and her father was the center of a scandal in Rome when he ran off with a much younger woman. The French newspaper, Le Figaro, included a death notice, most likely placed by Emanuela's grandson, Luis Alfonso de Borbon y Bordiu, who is considered by Legitimists as the rightful King of France, or by someone on his behalf. Death notices are not always accurate as the information is provided by the family. Emanuele is named as the widow of Don Jaime, Duke of Segvoia. The death notice also stated that she was the mother of HRH Don Alfonso, Duke of Cadiz (1936-1989), the grandmother of Don Luis Alfonso and the great-grandmother of Eugenia, Luis and Alfonso de Borbon. The death notice has omissions. Emanuela's younger son, Gonzalo, and his daughter, American-born Stephanie de Borbon and her four five sons, are not included. Don Jaime married Emanuela not because he loved her, not because he wanted a true Christian marriage, and not because she was pretty. He married her because she was not of equal birth. He renounced his rights in 1933 due to his disabilities. He was deaf and mute. He acknowledged that he chose to marry a woman of unequal right because he and he descendants would not have rights to the Spanish throne. Emanuela told her biographer that her marriage had been arranged by her mother, and former King Alfonso XIII of Spain. She was perfectly acceptable as a bride for Jaime, who no longer had rights to the Spanish throne. This renouncement was made two years after the Spanish royal family went into exile. The eldest son, Alfonso, the Prince of Asturias, renounced his rights not long before his brother, when he married a Cuban commoner. Alfonso, who was created Count of Covadonga by his father, Alfonso XIII, suffered from hemophilia, a disease he had inherited from his mother, Victoria Eugenia. The new heir to the throne was Alfonso XIII's third son, Don Juan, the Count of Barcelona. He made a most agreeable marriage with Princess Mercedes of Two Sicilies. She was named for her father's first wife, Mercedes, Princess of Asturias, the elder sister of King Alfonso XIII. By the mid-1940s the Segovia marriage was over. In reality, the couple never had a true Christian marriage. They made vows they could not keep. Life for Jaime was made more difficult by his disabilities. He was not well-educated, he did not have good job skills, and he had poor advisers. In other words, he was not prepared for a life in exile, a life away from Spain. Jaime was not close to his parents, nor to his brother, Juan. He was the son of an exiled king with no real purpose in life. Alfonso XIII died in 1941. By the end of the decade, Spain's dictator, Francisco Franco restored the monarchy, but without a king. It was largely determined that the Count of Barcelona's eldest son, Don Juan Carlos, would take on the mantle of the Spanish succession, although the Count of Barcelona did not give up his own claim to the throne until some years afterward. Legal separations and divorce were not permitted in Franco's Spain. Divorce did not become legal in Spain until 1981. Don Jaime, who was not a Spanish dynast, and who did not live in Spain, and Emanuela applied for divorce in Bucharest in 1947. This divorce was recognized in many countries, including Austria and Italy. In 1949, Don Jaime married a Berlin-born woman, Charlotte Tiedmann, who helped him get treatment for his disabilities. Emanuela also married for a second time in 1949. Her new husband was Antonio Sozanni, a wealthy Italian financier, who paid for her sons' school fees, for their clothes and much else. Don Jaime did not pay support for his children. He was more interested in seeing how many titles he could claim. Several years after his father's death, he decided to reclaim the throne of Spain. Never mind the fact, that his younger brother was recognized as Alfonso XIII's heir. Jaime also decided that he was the rightful king of France. He later added the title Duke of Madrid to his resume. To try to understand Jaime's claim, one most go back to 1700, when King Carlos II of Spain died. He named Prince Philippe, Duke of Anjou, younger son of the Grand Dauphin in France, as his heir. Philippe was the the grandson of Carlos's half-sister, Marie Teresa, who was the first wife of Louis XIV. Although there was some criticism of this decision, Philippe's father, the Dauphin, pondered, and then pronounced a decision. Philippe would inherit the Spanish throne, and he would renounce his rights and the rights of his descendants to the French throne. Philippe agreed to this decision. He renounced all rights to the French throne for himself and for his descendants and he became King Felipe V of Spain. King Juan Carlos is his direct descendant. The Anjou title reverted to the French crown, and was created several times for other members of the House of France. The French Revolution brought a temporary end to Bourbon rule in France. 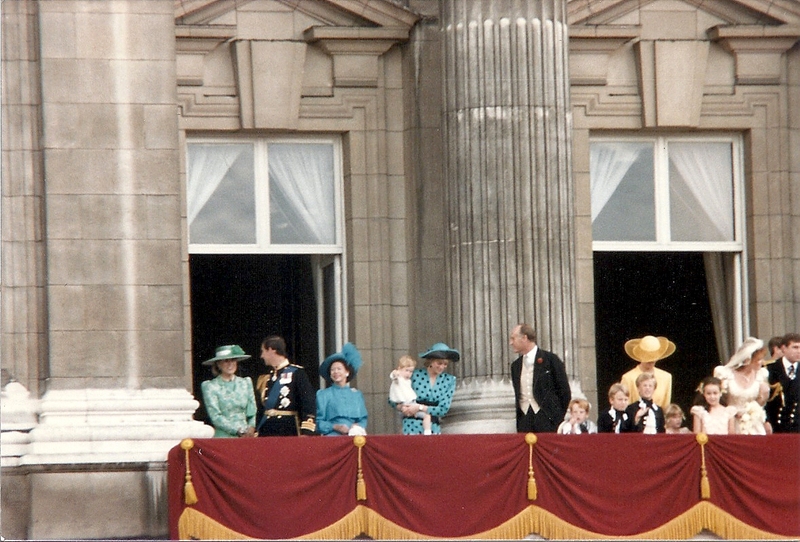 The monarchy came to an end in 1792. A year later, Louis XVI and his wife, Marie Antoinette, were executed. Their only surviving son, Louis-Charles, became the titular King Louis XVII. He died at the age of ten in June 1795. After the revolution and the establishment of the First Republic, France went through a series of bumpy patches. In 1804, a short Corsican declared himself Napoleon, Emperor of the French. In 1814, he suffered a series of military defeats, and found himself exiled to Elba. Enter a brief Bourbon restoration: King Louis XVIII, brother of the late King Louis XVI. He managed to hold onto the throne for eleven months before the wily Corsican escaped from Elba. He reclaimed his throne in March 1815. Less than three months later, he met his Waterloo, and found himself exiled on St. Helena. The Bourbons regained the throne with Louis XVIII again the king. He died in 1824, and was succeeded by his younger brother, Charles, who reigned until his death in November 1836. His eldest son, the Duke of Angouleme, was married to his first cousin, Marie-Therese, the only surviving child of King Louis XVI. Sadly, the marriage was childless. Charles X's younger son, the Duke of Berry, was married to Carolina of Bourbon-Two Sicilies. The Duke of Berry was assassinated while visiting at Paris opera in February 1820. His widowed Duchess gave birth to a son, Henry, eight months later. He was known as the Duke of Bordeaux. The infant duke was presented with the Chateau de Chambord, and the title Count of Chambord. Charles X remained on the throne until August 1830, when the French had yet another revolutionary hissy fit. [Meanwhile, back in Spain, Felipe's descendants still reigned.] He abdicated in favor of his young grandson, after a family battle with his elder son, the Duke of Angouleme, who finally agreed to renounce his rights in favor of his nephew. Alas, it was all for naught, and the throne passed to Louis Philippe, a scion of the Orléans branch of the family, a direct descendant of Philippe, Duke of Orléans, younger brother of Louis XIV. In the line of succession, the Duke of Orléans' descendants followed the male line descendants of Louis XIV. Philippe's descendant, Louis Philippe, Duke of Orléans, became king of French. Louis Philippe, the Citizen King, was swept away by revolution in 1848, with the establishment of the Second Republic. This lasted for four years, when Napoleon III became Emperor. He reigned from 1852 until 1870. His reign came to an end with France's defeat in the Franco Prussian war. When it comes to the French succession, the Bonapartes are largely seen as interlopers and parvenus. Felipe V's descendants were in Spain, as Spanish dynasts. Not French dynasts. The last king of France of Louis Philippe I, a member of the Orléans branch of Bourbon family. I must include a sidebar here as the main Bourbon line still had their own contender: Henri, the Count de Chambord. Henri, married to Archduchess Maria Theresa of Austria, still has his own supporters, but the couple had no children. After Napoleon III's defeat, Henri saw a glimmer of hope for restoration. He obtained the support from the Orléanists because they hoped he would be succeeded by Louis Philippe's grandson, Philippe, the Count of Paris. Instead, France established the Third Republic. Henri died in 1883, and Philippe did not get his throne. But he did receive the support of many of Henri's supporters. The present Count of Paris is a direct descendant of Philippe. This brings us back to Emanuela's death notice, the use of titles, marriage and the non-existent French throne. All of this reeks of hypocrisy. Emanuela acknowledged her her memoirs that her marriage was an arrangement. She loathed Jaime. He despised her. The Segovia title was bestowed on Jaime by his father, King Alfonso XIII. It is not a French title. Jaime eventually adopted the use of the title Duke of Anjou, although he has no real claim to the French title. Emanuela ceased using Segovia title after her civil divorce and remarriage. In August 1949, Jaime married Charlotte Tiedmann, and she was styled as the Duchess of Segovia. Emanuela began to use the title again only after the deaths of her former husband and his second wife, even though she was still married to Antonio Sozanni. Emanuela's elder son, Don Alfonso, was married to Carmen Martinez-Bordiu y Franco, a granddaughter of the Spanish dictator. Perhaps she truly believed that Franco would change his mind and give the throne to her son, and not to Juan Carlos. She was not fond of her daughter-in-law, and made it clear, publicly in her memoirs, Emanuela de Dampierre, Memorias: Esposa y madre de los Borbones que pudieron reinar en España. Her biographer, Begona Aranguren, noted that she was a very bitter woman. Aranguren worked closely with Emanuela on her memoirs, which were published when Emanuela was 89 years old. She personally approved everything that was published in the book. Yes, Emanuela suffered tragedy in her life. Her elder grandson, Francisco, was killed in an auto accident caused by his father's reckless driving. The Duke of Cadiz, whose marriage was annulled, died in a freak skiing accident. Gonzalo, who was not his mother's favorite son, died from leukemia. The death announcement in Le Figaro is a fairy story, not reality. It is exclusionary, as the announcement did not name Gonzalo, his widow, nor his only daughter and her four sons. Stephanie de Borbon never met her grandmother, although she very much wanted to get to know her. This is understandable. She spoke twice to her grandmother on the phone during visits to Madrid. Emanuela never asked her how she was, never asked her about her life. Luis Alfonso is assumed to be Emanuela's heir. Emanuela complained a lot. She complained about her life, her first marriage, her younger son. She tilted her windmill at a non-existent throne, and acquired a false persona. This strikes me as hypocritical. She and Jaime made vows, yet had no intention of keeping the vows. Emanuela entered the marriage on false pretenses. She did not have a Christian marriage. Why would she want to be associated with a man who did not love her, a marriage made by arrangement? Think of all the positive things she could have done after her divorce. She could have raised her sons to understand their real places in the world, and live not pipe dreams. She could have used her energies to highlight the dangers of excessive driving or help raise funds to find a cure for leukemia. She could have reached out to her granddaughter. Emanuela was one quarter American. She could have shared her history with her American granddaughter and her American great-grandsons. In fact, all of Emanuela's eight great-grandchildren were born in the United States. She didn't. She chose to allow bitterness to permeate her life and her views. In re-assuming the title Duchess of Segovia, she made a mockery of Christian marriage. Marlene, your posting and comments are wonderful. I just have one question. Were the sons from the first marriage? This is someone I'd definitely like to know more about. Perhaps George IV of England was in love with his wife Caroline of Brunswick, the same for other monarchies, I do not think, the marriage arrangements was something very common, for something many of the sovereigns had second families, Louis XIV, the Great Dauphine , Tsar Alexander II, etc. Lovers of both were normal. The resignation of Felipe V of Spain, may well be, but his own, can not resign on behalf of his children. Marlene,are you aware of any "rule" or "house law " that forbids Philippe or any male dynastic from renouncing the rights of their descendants?